A file photo of f inance minister Pranab Mukherjee. New Delhi: The plan to give foreign supermarkets access to India’s retail industry is “very much on the government’s mind", finance minister Pranab Mukherjee said on Friday, weeks after New Delhi was forced to backtrack on the reform. He said the government was now working for a political consensus on foreign direct investment plans in supermarkets and a delayed pensions bill. The Pension Fund Regulatory and Development Authority (PFRDA) Bill, which was expected to be passed in the current session of Parliament, has also been put off due to opposition from the Trinamool Congress, a key ally of the Congress party. “Commitment to FDI, commitment to PFRDA and all other major legislation which are part of new generation are very much in the mind of the government and we are working very hard to build up the consensus," Mukherjee said. 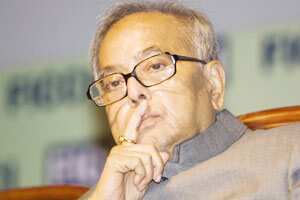 On the fiscal front, Mukherjee admitted to challenges but said the Indian economy is suffering a temporary setback. “Yes the situation is difficult", Mukherjee said. “I do believe we have the capacity, we have the resilience to overcome this difficulty," he added. Struggling with a rapidly weakening rupee and a widening current account deficit, Asia’s third largest economy is looking for ways to attract foreign capital. The finance minister reiterated the government’s view that growth in the current fiscal year could be between 7.25% and 7.75%, lower than the 9% budgeted earlier in the year. Underlining the government’s optimism that price pressures are beginning to moderate, he said end-March inflation could be 6-7%. Prime Minister Manmohan Singh on Thursday warned India’s economic performance was affected by the possibility of a severe crisis in the Euro zone and sluggish US growth, combined with volatility in global food markets and high energy price. India’s food inflation eased sharply to 1.81% in the year to 10 December on lower prices of rice, cereals and vegetables and benefiting from a higher statistical base a year ago, indicating sticky headline inflation could be moderating. India faces a challenging fiscal situation as slowing revenues due to slower growth have pressured government finances. Many analysts say the government will overshoot its budgeted fiscal deficit target of 4.6% for the current fiscal year by as much as a full percentage point. The rupee has fallen nearly 20% against the US dollar from its July highs.